This essay posits the idea of ‘cosmo-localism’ (or ‘cosmo-localization’) as a potentially useful concept in both explaining a new economic model and in formulating sustainable development pathways. It is a thought stimulation exercise that invites us to join a conversation about the design of a new political economy. Such assumptions, if and when they are proven to be correct, will also represent potential benefits of cosmo-localism. Knowledge and design resources for a variety of critical support systems are now available in the distributed web under open licenses (creative commons / gnu / copy left), which include: pharmaceutical drugs, food production systems, machinery, automobiles, 3d printed products, robotics, and in many other areas. Literally millions of designs are available under open licenses that allow people to do local 3-D printing, build machinery, robotics and micro-controller systems (Arduino and Raspberry Pi), and food production and agricultural systems, medical applications and medicines, and even the building of electric cars, for example the farm hack project. A third factor driving the potential for cosmo-localism is the maker movement. The maker movement is a very broad church and includes everything from preindustrial handcrafts such as jewelry making (e.g. the Etsy marketplace), textile making to well-established industrial crafts such as metal foundry work, power-based woodwork and welding, but also straddling the high-tech end of the spectrum. The grassroots maker movement has a strong commitment to open source and knowledge justice approaches, localization, community learning and sustainable closed loop / circular economy strategies. Reuse, repair, repurpose are common words. The potential of the maker movement for cosmo-localism lies in this broad church beginning to learn from each other’s knowledges and capabilities and to collaborate on the design and manufacturing of things that require a high level of coordination or organization. At the moment the maker movement is a fluid network, dynamic, creative and explosive, but not yet coordinated toward mainstream material production. To make things for commerce requires disciplined coordination, organization and capital, more typical of industrial models. 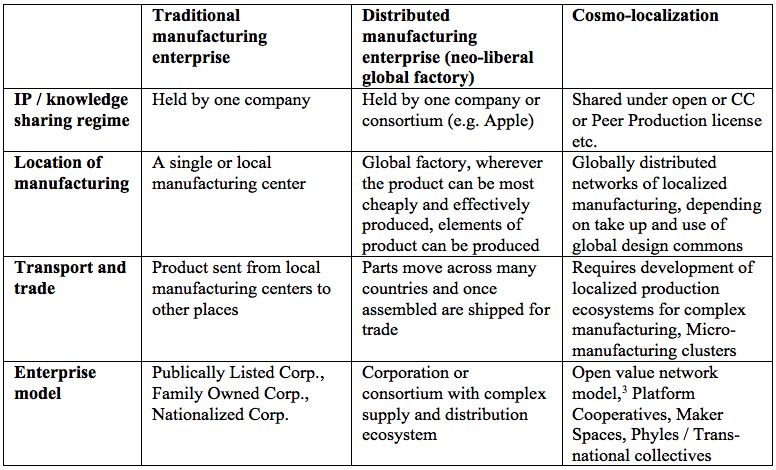 Platform oligopoly is the first challenge to cosmo-localism, the power of the big Silicon Valley enterprises to monopolize and potentially suppress the potentials for cosmo-localism. Big platforms, like Facebook and Google, but now sharing platforms like Air BnB and Uber derive value from our practices of relationality. There is great value in the things that they have innovated, and yet the monetary value generated by users on these platforms through their sharing and interactions are not shared for social reinvestment back to the user’s communities. Michel Bauwens calls this ‘netarchical capitalism’, whereby platforms get wealthy at the expense of contributors, who enter into a form of economic dependence / precarity with such platforms. Cosmo-localism relies on supporting a global knowledge / design commons while supporting investment in localized maker enterprises. Cosmo-localism based on extractive platforms would be stunted, as cosmo-localism requires systems for localized re-investment that are now being discussed as platform cooperativism. Over time, however, cosmo-localism might support a civilisational bootstrapping, as trans-regional networks and value exchange systems widen, allowing a DGML economy to work.